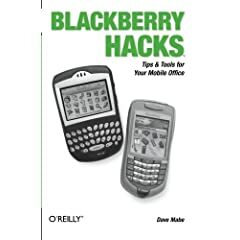 I’ve been busy for the last several months working on a book for O’Reilly Media called BlackBerry Hacks. It will be published in O’Reilly’s excellent Hacks Series. O’Reilly should have the complete hack list on the book’s web site pretty soon. They’ll also include some free sample hacks from the book. This book would certainly not have turned out nearly as good without some excellent contributors. Their work was critical to the success of this project. Thanks! Also a special thanks to Loren Beckerman from Cingular who went out of her way to provide best-in-class wireless service for me while I wrote the book. Thanks, Loren!! You can order the book from Amazon here. I’m told it will be shipping in mid to late October. A special thanks to the folks at O’Reilly for giving me this opportunity! This entry was posted in BlackBerry, Everything on October 5, 2005 by Dave. Well I do not like the fact that you just mention Magmic as the main gaming house for BlackBerry. Maybe if you would check Handango then you will notice that their games are far below competition judging from the sales point of view. The games that appear in this book are not even the best in their category. Criss, I guess you’re referring to my article on the O’Reilly Network where I briefly mention the BlackBerry as a gaming platform. There are other games mentioned in the book in addition to the Magmic games. That said, I think you’d be hard pressed to convince people that Magmic at this point isn’t the undisputed leader. There may be other games that are as good or even better, but there’s no doubt that Magmic has an advantage if not just a first mover one. Thanks for the comment.